As the rate of high cholesterol continues to increase across the United States, many are turning to more natural approaches in an attempt to restore balance in the body. Despite decades of government advice that warns against the consumption of saturated fats, coconut oil has attracted attention as a heart-healthy choice. However, you should still consume it as only an occasional part of your diet because of the lack of long-term studies investigating its safety. The liver produces cholesterol, a waxy fat-like substance, to help build lipoproteins. These transporters help carry fats around the blood. Cholesterol is bound into low-density lipoproteins and high-density lipoproteins. The former, also known as LDLs, move fats into and around the bloodstream. While they can contribute to the unwanted accumulation of cholesterol in the arteries, HDLs do the opposite by sweeping unused fats back to the liver. For this reason, raised LDL levels are considered a health risk while sufficient quantities of HDL remain desirable. 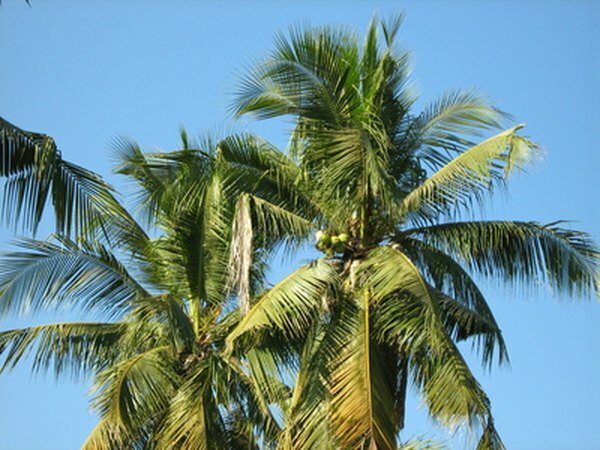 Making up almost two-thirds of the edible sections of the fruit, coconut oil remains thoroughly unusual for a plant oil. Almost entirely saturated, it stays solid at room temperature, while most other plants contain oils that are liquid at room temperature. Dr. Bruce Fife, a doctor of naturopathic medicine and the author of “The Coconut Oil Miracle,” believes that official advice on saturated fats is misguided and does not take into account the positive health effects demonstrated by coconut oil; he puts these down to the content of polyphenols and medium chain fats. Dr. Fife notes that, due to their molecular structure, the medium chain fatty acids in coconut oil can increase the rate of fat burning within the body. This appears to have several effects on the cholesterol profile in the bloodstream, boosting HDL while lowering LDL. The polyphenol content in the oil can also prevent the oxidation of cholesterol, an important step in the development of atherosclerosis. A 1990 study that looked into the effects of coconut oil on cholesterol levels split volunteers into two groups, feeding one with coconut oil and the others with that from soybeans. The research team, based in Sri Lanka, found that coconut oil boosted HDL levels, while soybean lowered them. LDL levels did not change significantly. The results graced the pages of the “British Journal of Nutrition.” A more recent study, published in the "Asia Pacific Journal of Nutrition" in 2011, found that consuming extra-virgin coconut oil increased the levels of beneficial blood cholesterol in pre-menopausal women. In light of the above evidence, it would appear that coconut oil does not lower overall cholesterol levels in the bloodstream. However, it can change the ratios of HDL and LDL by increasing your HDL levels, which creates a more blood cholesterol profile. However, Dr. Walter Willett, writing for Harvard Health Publications, recommends consuming coconut oil in moderation, because there are no long-term studies investigating the health effects of coconut oil, and it might still post a health risk. “Know Your Fats”; Mary Enig PhD; 2000. British Journal of Nutrition: The effect of daily consumption of coconut fat and soya-bean fat on plasma lipids and lipoproteins of young normolipidaemic men.